Melt Country Crock® Spread in 3-quart saucepot over medium heat and cook onion with garlic, stirring occasionally, 3 minutes or until onion is tender. Stir in rice, 3 teaspoons Knorr® Chicken flavor Bouillon and water. Bring to a boil over high heat. Reduce heat to low and simmer covered 10 minutes. 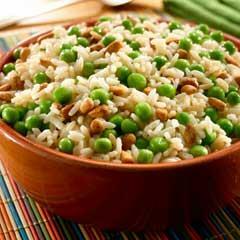 Stir in peas and cook 10 minutes or until rice is tender. Stir in pine nuts, remaining 1 teaspoon Bouillon and, if desired, black pepper.